Imani was the smallest child in her village. The other children teased her, but her mama told her stories at night which lifted her spirits. One night Mama told her the story of Olapa, the goddess of the moon who won a mighty battle against the god of the sun. That night Imani dreamed that she fought with Olapa and protected the people of the earth. 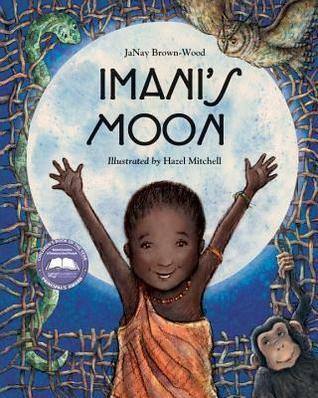 The next day, Imani was determined to touch the moon but she fell from a tree. The following day, Imani built a pair of wings but she crashed into a tree on her first flight. The day after that, Imani watched warriors jump and decided to jump to the moon herself. She jumped all day and into the night, and with one final jump she landed on the moon. Olapa praised her and gave her a moon rock to take home with her. That night, Imani told her mother a story, her story, about a girl who believed she could touch the moon. JaNay Brown-Wood tells the story of a little girl with big dreams. Set in Africa, in Kenya, in a village of the Maasai people, Imani’s story is told. Rich in language and culture of the people, Imani learns that you must believe in yourself if you want to accomplish something as wonderful as touching the moon. And JaNay Brown-Wood, believed she could write a book for children, and she did! This is her first picture book. Hazel Mitchell brings Imani’s world to life through her beautiful illustrations. The innocence of Imani’s spirit, the faith of her mother, and the doubt of the unbelievers feel as real as if they were standing in front of you. Hazel Mitchell gives even the animals, human qualities and gives the readers rich details in each scene. I love this new picture book! It speaks so gently and eloquently to the young reader. It gives children a story in which faith and determination are equally important in reaching one’s goals.